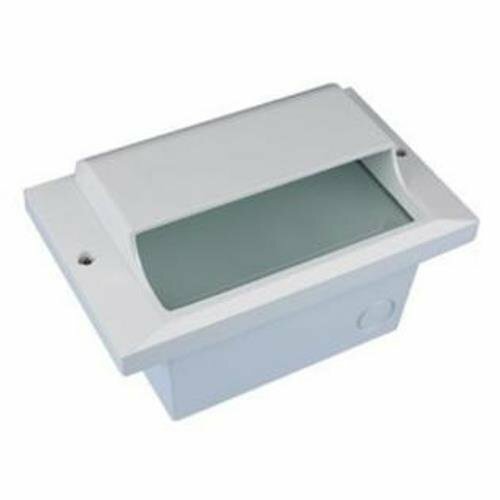 National Specialty Lighting LST-S-WH-WH LED Step Star Scoop Cover 5W 120V 3100K Dimmable Wall or Ceiling Mount Recessed Light features a White finish and Scoop Cover with a Frosted tempered glass lens to evenly distribute the LED illumination. Both the cover and can are die cast aluminum for corrosion protection, strength, weight, and consistency of finish. By illuminating a steep decline in a staircase, or any walkway or room, the simplicity of this highly energy efficient fixture can have a profound impact in a home or business for safety and assurance that will be appreciated for a lifetime. The fixture includes a 5.2W, 73.5 Lumen, 3100K 120V 40,000-hour long-life Replaceable and Dimmable LED module, and no integral LED Driver is required. The Replaceable LED Module LEDMOD-32-FF is available to purchase separately if a backup module is desired. The LST-S-WH-WH is 7.5IN wide x 4.625IN high x 1.5IN extension from the wall, and the recessed portion is 5.5IN wide x 2.5IN deep x 3.625IN high. Numerous 120V 1/2-inch NPT fittings are available for standard Romex input, and 120V push-in connectors are included for ease of power input. Up to 150 fixtures can be parallel wired (daisy chained) per 120VAC tap. It is UL listed for Wet Locations for all Indoor and Outdoor wall, ceiling, and concrete pour applications. If used in a concrete pour or brick wall, Step Light Concrete Cap SL-CC is required, and can be purchased separately (not included). Suggested uses include steps, aisles, halls, paths, patios, entry, posts, ceilings, and showers – for multiple application possibilities. The LST-S-WH-WH comes one per package, and includes everything needed for installation in wall or ceiling wet location applications.